CheapOair, a leading flights-focused hybrid travel agency, has announced its travel trend predictions for the upcoming year. By analyzing year-over-year data, and taking factors into consideration such as the economy, demographics of travelers, current events, airline trends and more, CheapOair’s data team is anticipating some fascinating developments for 2017. Millennial Travelers: Millennials are transforming the travel space as we know it. Over 80% of Millennials consider online travel reviews important and will shop multiple travel sites before making a purchase. Additionally, 76% seek out the help of friends and family through social media when planning their next getaway. When booking airfare, hotels, and rental cars, Millennials are using their phones or tablets nearly 50% of the time . Consistent with their reliance on social media for planning trips, Millennials post to social media sites about their travel experience with nearly 73% posting at least once a day . Business Travel: In the next 4 years, Millennials will make up more than 50% of global workforce, and they are already the largest segment of business travelers . According to the Global Business Travel Association, on average, business travelers took 6.8 trips last year, a number which is expected to increase to 7.4 next year. In 2016, Millennials were already reportedly taking 7.4 trips compared to 6.4 for Gen Xers and 6.3 for Boomers . ‘Bleisure’ Travel: Business people traveling for work who tack on additional leisure travel days are now being labeled as ‘bleisure’ travelers. Often, a family member or significant other come will along on these business trips so that after the ‘business’ portion of the trip is completed, they can spend a day or two vacationing. While the average age of business travelers is from mid-40s to mid-50s, the biggest increase in ‘bleisure’ travel is due to travelers aged mid-20s to mid-30s. According to a recent survey conducted by Hipmunk, 55% of Millennials said they would extend a business trip into a leisure trip compared to 28% for business travelers aged 35-54 . Cuba: U.S. travelers to Cuba rose by 80% during the first 6 months of 2016 . By 2017, ten airlines including Alaska Airlines, American Airlines, Delta, JetBlue, Frontier, Silver Airways, Spirit, Southwest, Sun Country, and United will begin regular daily and/or weekly service to 10 Cuban cities. The island-nation has the potential to see additional growth in 2017, as long as the political relationship between the U.S. and Cuba remains stable. Air Pricing Forecasts: The cost of airline fuel continues to remain flat, which should help keep airline tickets near record-low prices in 2017. According to the Global Business Travel Association, airfare is expected to increase by an estimated 2.5%, but fares may actually decrease in certain regions. In recent years, Asia and LATAM (Latin America/Mexico) saw a nearly double-digit increase in capacity, which significantly drove down pricing. This has caused the expected average ticket cost for Asia and LATAM to decrease by 1.1% and 1.9% respectively . Ancillary Revenues and Fees: According to a study conducted by IdeaWorksCompany, it is estimated that ancillary fees contributed to 9.1% of airline revenue in 2016, which has nearly doubled in the past six years. In 2017, ancillary products will continue to have an increasing impact, as they could contribute to over 10% of total airline revenue by the end of 2017. Originally, it was low-cost carriers such as Spirit Airlines that capitalized on this model, but it is expected that more airlines and travel companies will be implementing this in the near future . Expected Overall Growth: The United States will continue to be the largest single market for domestic passengers, followed by China, which is firmly established in second place. The U.S. is also expected to reclaim the top spot from Germany for contributing the most international passengers . For more information, please visit www.cheapoair.com, www.cheapoair.com/mobile, or our social media pages, facebook.com/cheapoair and twitter.com/cheapoair. CheapOair is a next generation concierge travel agency (online/traditional) that enables consumers to book travel online, on its award-winning mobile app, by phone or live chat. CheapOair bridges the gap between an online and traditional travel agency with certified agents available 24/7 to help find deals and offers to destinations worldwide on over 450 airlines, 150,000 hotels, and many car rental companies worldwide. Partner airlines benefit from access to CheapOair’s broad customer base that books high yield international travel and add-on ancillaries. Follow CheapOair on Facebook and Twitter to learn how to travel the world for less or go to www.cheapoair.com or call 1-800-566-2345). CheapOair, a leading flights-focused, next generation concierge travel service, was recently recognized at the Interactive Media Awards as “Best in Class” Travel and Tourism website. CheapOair secured the win with a high overall score of 482 out of 500 points. Created by the Interactive Media Council (IMC), a nonprofit organization of leading web designers, developers, programmers, advertisers and other web-related professionals, the Interactive Media Awards recognize the highest standards of excellence in website design and development. This award follows a number of other accolades this year recognizing CheapOair’s excellence in website, mobile web, and mobile app design including the Travel Weekly Magellan Awards and the Stevie Awards. CheapOair is a flights-focused hybrid travel service that enables consumers to book online, on mobile apps, by phone or live chat. CheapOair (http://www.cheapoair.com, 1-800-566-2345) bridges the gap between an online and traditional travel agency with certified travel agents available 24/7 to help find deals and offers to destinations worldwide on over 450 airlines, 150,000 hotels, and 100s of car rental companies. Partner airlines benefit from access to CheapOair’s broad customer base that books high yield international travel and add-on ancillaries at above the industry average. Follow CheapOair on Facebook and Twitter to learn how to travel the world for less. Fareportal, a high-tech, high-touch travel company powering the next generation of travel, and Amadeus, a leading provider of advanced technology solutions for the global travel industry, announced today that customers booking through CheapOair or OneTravel now have the ability to book preferred seating on select airline partners through Amadeus’ global distribution system. The new technology allows travelers booking flights on CheapOair and OneTravel to see a real-time view of the available seats along with any additional costs associated with preferred seating. Due to Fareportal’s history of successfully selling ancillary products, Fareportal was selected by Amadeus as a partner to pilot test this new functionality on American Airlines flights. The system integration allows customers to select paid seats through the interactive seat map before checkout for a seamless booking process and an enhanced customer experience. And although this back-end update will go unnoticed by consumers during the booking process, behind-the-scenes connectivity based on the latest NDC standards will help ensure more user satisfaction. “At Amadeus, we are focused on providing technology and global travel content that enables our industry partners to offer consumers clear and convenient options so they can book their desired travel experience. The broader the choice, the better it is for the entire travel ecosystem,” said Scott Gutz, Chief Executive Officer, Amadeus North America. 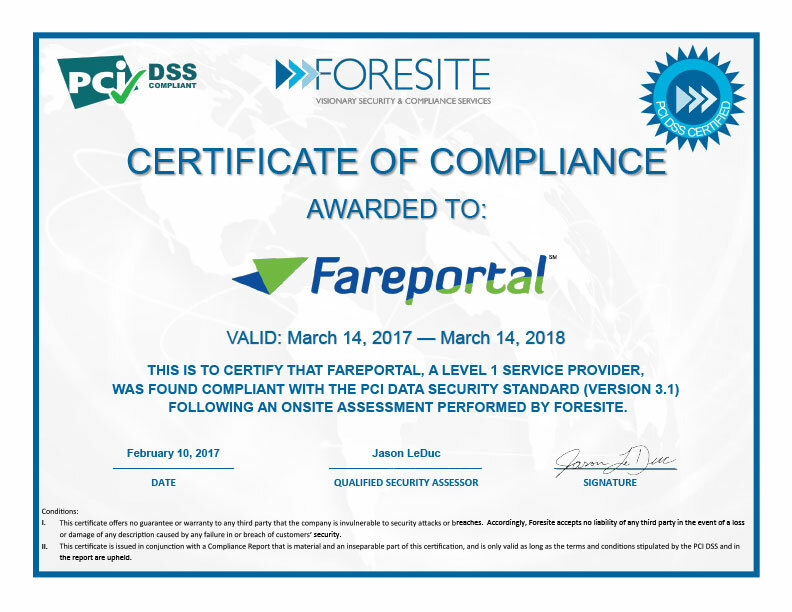 Fareportal is dedicated to continually improving technology as well as providing added value for customers. Fareportal is excited to continue to lead innovation in the ancillary product category to offer customers more choices and more flexibility. Fareportal is a high-tech, high-touch Travel Company that powers the next generation travel concierge service. Utilizing its innovative technology and company owned and operated global contact center, Fareportal has built strong industry partnerships providing access to over 450 airlines, 150,000 hotels, and hundreds of car rental companies that serve millions of customers every year. With a portfolio of consumer travel brands, including CheapOair and OneTravel, Fareportal’s airline partners can benefit from access to a broad customer base that books high-yield international travel and add-on ancillaries. Amadeus provides the technology which keeps the travel sector moving – from initial search to making a booking, from pricing to ticketing, from managing reservations to managing check-in and departure processes. Our products and solutions help to improve the business performance of our customers: travel agencies, corporations, airlines, ground handlers, hotels, railways, car rental companies, airports, cruise lines and ferry operators. At the heart of our approach is innovation. Amadeus was recognized in 2014 and 2015 as the leading European investor in R&D for the travel and tourism sector by the EU Industrial R&D Investment Scoreboard, which ranks European companies by total investment in R&D. Over €4 billion have been invested in R&D since 2004. It is this strong commitment that we believe will enable us to continue working with our customers and partners to shape the future of travel. Amadeus works in more than 190 markets with a worldwide team of more than 14,000 people. For the year ended December 31, 2015, the company reported revenues of €3,913.0 million and EBITDA of €1,465.0 million. Amadeus is listed on the Spanish Stock Exchange and forms part of the IBEX 35 Index. CheapOair®, a leading flights-focused hybrid travel agency, today announced its top ten most popular domestic and international destinations for the 2016 holiday season. Los Angeles, CA, Denver, CO and Dallas/Ft. Worth, TX dominate this year’s top three holiday destinations. In addition, CheapOair’s data shows that the average airfare prices have decreased by 3% year over year. This December, many international travelers are planning to visit warm weather destinations like San Juan, Puerto Rico and Cancun, Mexico. Domestically, Charlotte, NC saw the largest decrease in airfare this year, dropping about 21% compared to 2015, with Phoenix, AZ and Atlanta, GA trailing behind, decreasing by 11% and 6% respectively. Outside of the 50 states, San Juan, Puerto Rico has claimed the number one spot on the list of top destinations this year. CheapOair’s data also shows that in addition to tropical locations, two Canadian hot spots are among the top destinations this season, with Vancouver experiencing a 4% increase in pricing and Toronto seeing a 23% decrease since 2015. For more information, please visit www.CheapOair.com, www.cheapoair.com/mobile, or our social media pages, www.Facebook.com/CheapOair and https://twitter.com/cheapoair. CheapOair is a next generation concierge travel agency (online/traditional) that enables consumers to book travel online, on its award winning mobile app, by phone or live chat. CheapOair bridges the gap between an online and traditional travel agency with certified agents available 24/7 to help find deals and offers to destinations worldwide on over 450 airlines, 150,000 hotels, and many car rental companies worldwide. Partner airlines benefit from access to CheapOair’s broad customer base that books high yield international travel and add-on ancillaries. Follow CheapOair on Facebook and Twitter to learn how to travel the world for less or go to www.cheapoair.com or call 1-800-566-2345).